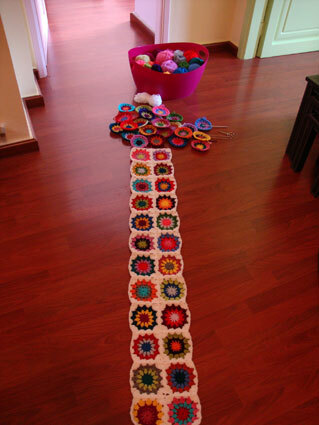 « Hexagonal throw done!! Hourray!!!!! Good morning Angie! I’m having my morning coffee and it’s rainy here, too! 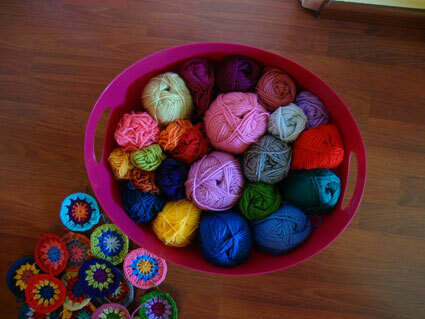 So your colourful ‘basket’ with yarns and the new crochet are really welcome! They are beautiful and I’m sure that ‘basket’ is the best. Good morning, the basket is great! I love it and hope I will find one oneday. I’ll buy it at once 🙂 The blanket is becoming beautiful!! Have a good week! Hi! Your fairytale blanket is looking great. I agree with you, new clothes vs new yarn…no contest!! Your blanket is coming along nicely. Can’t wait to see the finished bedspread. Colours look fabby, I’m sure the girls will love it. 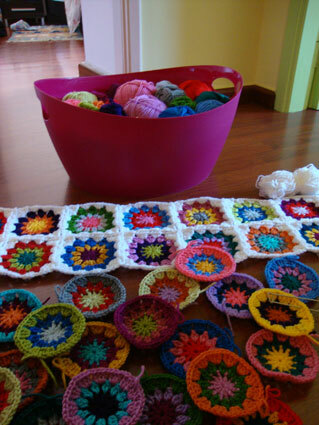 I love the colors that you used for the blanket! And I love your purple container, too! No warm weather for us over here. It has been raining heavily for more than a week now. Anyway, have a great week ahead! Hi Angie … this morning it is -17 Centigrade here and there is a lot of snow on the way (maybe as much as 30 centimetres) and I’m grumpy as a result! I don’t like the cold and snow! Your fairy tale blanket is very pretty – whichever daughter gets it will be very lucky to have it!! You have a lot of patience to make this. 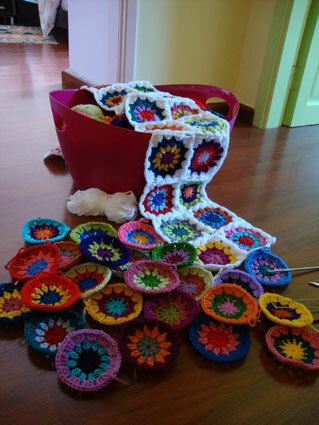 That is going to be a gorgeous blanket, and I’m glad you’re having such fun with the colors! I have one of those baskets / tubs, too! Mine is light blue, and I currently have an unfinished granny stripe blanket living in there, along with all the balls of yarn. My wardrobe also suffers from yarn purchases. Ah well. Here in the UK we call your basket a trug – I think they’re primarily used in the garden but they’re so useful I have several I use in the house! Angie, I’m loving your fairytale blanket. You’ve inspired me to make something similar for my girls’ beds at my mum’s new house. I love the contrast of all these vibrant colours with the white background. I have seen some lovely duvet covers (sets) in the new Spring collection of Zara home. They are white with embroidered dots in different colours and feel that these fairytale blankets would go great as bed throws at the end of these duvet covers. Lovely! That is going to be so pretty when it’s done. je ne suis pas très douée pour écrire en anglais, mais, vu ton prénom et le nom de ton blog, tu devrais me comprendre. Tout d’abord, je voulais te féliciter. Tout est magnifique, coloré, joyeux…..J’adore et ça me donne même envie de me remettre au crochet. J’ai vu que les laines que tu emploies sont souvent l’acrylique, que, j’avoue, j’aime pas beaucoup. Connais tu l’équivalent au niveau couleurs et grosseur de laine avec une laine ???? What a gorgeous blanket! I’m working on something very similar for my daughter (http://sandramcd.blogspot.com/2011/02/back-to-school.html) but the colours are much more citrusy – I think I prefer yours! 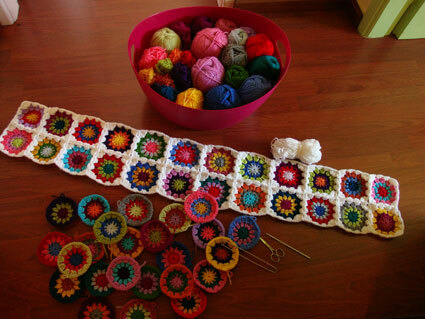 Angie this is going to be the prettiest blanket, Very inspiring…. beautiful! What pattern are you using? icy cold in Pennsylvania today! What a beautiful production line of prettiness!